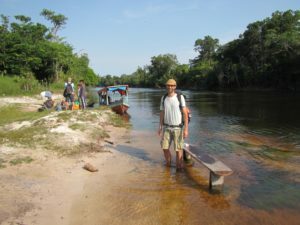 Yesterday I came back from the Brazilian Amazon. I gave a criminology course to public prosecutors and I brought solar chargers and batteries to Maró indigenous territory. A big thank to Maurits Groen of WakaWaka and Michiel de Koning of Heroes and Friends for these gifts. On the picture chief Dadá tests one of his new large solar chargers in the morning sun. It charges his GPS camera and also a battery, with energy for several days of camera use. 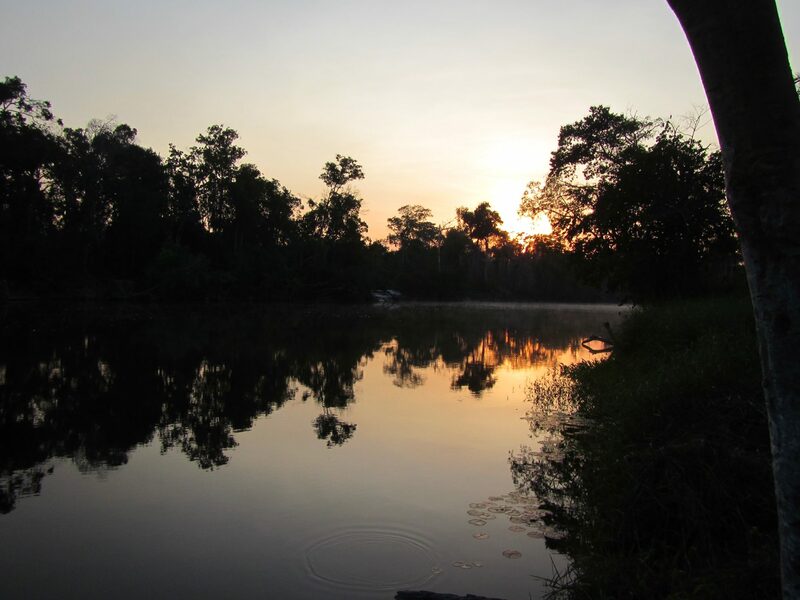 In 2014 I initiated a pilot of GPS-supported forest community watch in the Lower Tapajos and Lower Amazon. Together with CPT, Brazil’s Pastoral Land Commission, we distributed waterproof GPS cameras at several hotspots of illegal logging, deforestation (for cattle and soy) and related conflicts. We started with Dadá and Maró territory. 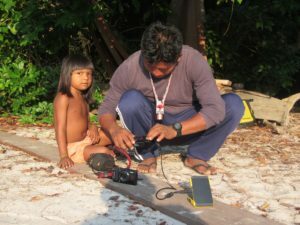 We first gave one, and later two more GPS cameras to Dadá, second chief of the Maró Indigenous Territory. Already in 2014 they managed to kick out two logging companies from their territory. 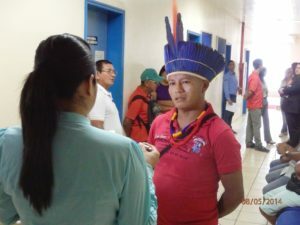 The authorities in Santarem, at two days boat travel, acted immediately when chief Dadá presented them pictures, with GPS coordinates, of piles of illegally logged timber and also buildings of logging companies in Maró territory. Timber is big business in this area of primary forest. The CEO of a logging company once offered Dadá a suitcase full of money if Dadá would allow logging. Timber traders and also some farmers (cattle and soy) land with their planes on a nearby landing strip, an enlarged logging road. As Dadá actively resists illegal logging and deforestation in the area, he has been a target of hired gunmen for many years. After surviving a kidnap, torture, and also murder attack he managed to enter the protection programme of the Brazilian State. In Santarem, also an important timber and soy export hub, he moves around with a police bodyguard. Three teams of young men patrol Maró territory to protect it against illegal logging and other invasions. Especially ipé (iron wood) is targeted, the most expensive wood species, which is popular in the EU and US. 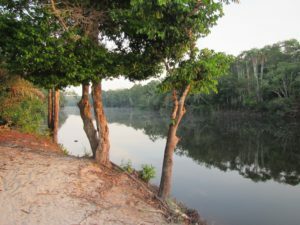 Ipé is currently being out-logged in the forests around Maró territory. The Maró community already lost a big ipé of two meters diameter. They also lost some smaller, but still very large and old trees. Recently, Dadá spotted a vehicule of aluminium multinational Alcoa in their territory. He told them to leave, as they were there without permission. Of course the Alcoa staff knew. It was and is clearly indicated on and along the one and only road accessible by cars and trucks that they were in Maró territory, which can only be entered with permission. Alcoa was lucky that Dadá did not carry his GPS camera, as he was actually hunting and not patrolling at that moment. Solar chargers and batteries greatly improve the work of the surveillance teams, that sometimes spend two weeks in the forest. From now on, they are no longer dependent on a diesel generator, which they usually switch on two hours per night. Portable solar chargers allow them to charge cameras and batteries at any time and at any place. On last week’s trip I was joined by Dutch radio makers Mirjam van Biemen en Mijke van Wijk, who make a radio documentary about me and my work in the Amazon (for Radio Doc, VPRO radio at Radio 1). I am grateful to Mirjam and Mijke for coming along. Their work will give more exposure to the deforestation problems and conflicts around cattle, soy and timber in the Amazon, as well as to our harm reduction activities. The journey to Dadá and Maró territory was more adventurous than expected, so I guess this will be part of the radio documentary too (due for mid-December). This pilot with waterproof GPS cameras at this and other places has shown to have real local and regional effects. It empowers forest communities, it improves forest protection, and facilitates and increases law enforcement and the rule of law. Public prosecutors and other law enforcers are happy with it, as it provides hard evidence from the interior of the Amazon. On a larger scale, it is nothing more than harm reduction, because deforestation has not halted yet. Last week we saw several large trucks with huge logs, especially at night, which usually indicates illegality. They were loaded with parts of centenarians, trees of more than one hundred years old (see 1st picture below, under comments). Deforestation for soy also continues in the Amazon, despite international agreements. We now wish to expand this project. More GPS cameras and more solar chargers with batteries in more areas to begin with. Later also bicycles and other (e.g. phone and drone) technology to facilitate patrolling, radio communication and also legal support, for taking law breakers to court. The ultimate goal is forest preservation through forest crime prevention – together with forest communities and with support from others. For me, this has been voluntary work so far. This year, I met Maarten Robben of Fresh Forces and Tim Manschot of Heroes and Friends who offered their free support such as with setting up a foundation. A big thanks to Maarten and Tim for their support and crowd funding ideas. That is why, this time, I came back with pictures and videos that show what we are doing. I took some pictures when Dadá was testing the small and large WakaWaka solar chargers. His daughter, the next generation, was watching. On this picture, Dadá looks up. I later realized it was because a motorised boat approached over the Maró River. A chief like Dadá is always on the watch – even more with three foreign guests visiting his community.